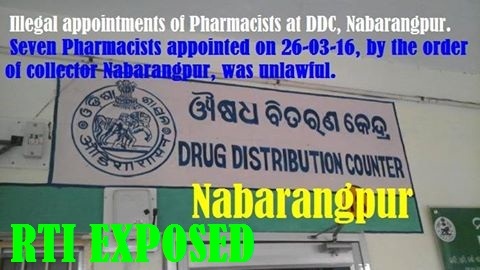 Nabarangpur-Online: RTI exposed over illegal appointment of Pharmacists in DDC Nabarangpur. RTI exposed over illegal appointment of Pharmacists in DDC Nabarangpur. Even though 157 unemployed pharmacists applied for the Drug Distribution Centres (DDC’s)in government run hospitals they are yet to receive any information on their appointments. Expressing deep concern over the appointment procedure and criterion, these unemployed Pharmacists candidates, recently filed a Right to Information Act (RTI) in the respective departments in the District. Though the local candidates have applied for the posts of Pharmacists but no initiative has been taken by the District Administration as found by the RTI. The unemployed pharmacists who well deserve the posts remain jobless and facing lot of difficulties, all of which are wastage of time and money for applying the posts. The RTI revealed that on 12th September selection meeting was organised but the former District Welfare Officer Nabarangpur who was a member of the committee was absent in that meeting. Notwithstanding the new DWO of Nabarangpur who joined on 14th September put his signature on the selection proceedings of the committee. The question which, thus, arises how the selection committee appointed the pharmacists without publishing the merit lists of the 157 candidates. Even though there was a alteration and clarification on the appointment of the pharmacists by the Principal Secretary health, government of Odisha. Further revealing on the contents of the RTI, on 26th March Collector Nabarangpur selected seven candidates bypassing the order of the principal secretary health dept. government of Odisha. Vide letter No 531/16 the collector Nabarangpur directed the CDMO to issue engagement orders to the candidates. Surprisingly on 26th the CDMO Nabarangpur served the engagement order through the peon. The peon book revels the individual service of the engagement letters to the candidates who are residing at Balasore, Baragarh, and other districts. Although the candidates joined on the same day 26th and 27th on Sunday which appears illegal appointments. The appointments were not made in terms of statutory rules. Several qualified persons in terms of the statutory recruitment rules for the post were awaited for justice but the collector directed to issue the engagement orders bypassing all the rules alleged the pharmacists. Five infants branded in Nabarangpur.